Leeds head coach Neil Redfearn has warned the club about the danger of selling their talented young players. Full-back Sam Byram, 21, and midfielders Alex Mowatt, 20, and Lewis Cook, 18, have all been linked with moves away from Elland Road. The team faces an uncertain summer with Redfearn unsure if he will still be in charge next season and long-term questions over the club's ownership. 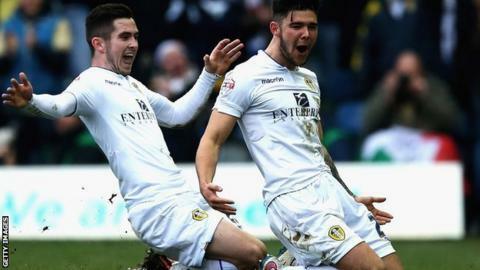 "It'd be a disaster to sell the young lads," he told BBC Radio Leeds. "They are a really important part of Leeds rising again. They are the building blocks. "The idea of blooding them and giving them experience in a difficult season is to put that base in place. It's not the idea to put the base in and then sell them. "All the stuff that has been said to me by the owner and the chairman throughout the season is that the kids are not for sale. I have to take them at their word." The former Champions League semi-finalists, who are 15th in the Championship, have spent the last 11 seasons outside the Premier League - with three of them in the third tier. It is unclear who will be running the club next season, with former owner Massimo Cellino, who has been banned by the Football League until the end of the season, saying he wants to clear his name before returning. They have fallen to four successive defeats since assistant Steve Thompson was suspended earlier this month, without explanation. Despite not being contracted beyond the end of this campaign, Redfearn said he was making plans for pre-season. "I've got things in place that I want in place and I'm hoping that if I am here that is what we will do," he added. "I've had a lot of experience of doing pre-seasons at this level and I know what's needed. "I've got to be positive and I've done myself no harm. It might not seem it off the back of four defeats but I've got this football club in a good place."